NIA Charlestown Nevis – Paradise Beach Nevis Ltd., located at Colquhoun Estate, is currently under its final phase of renovations and is slated to complete the works in late April with its grand opening slated later this year. Deputy Premier of Nevis and Minister of Tourism Hon. 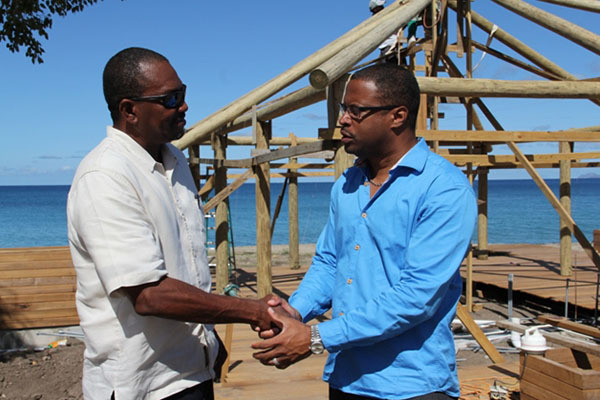 Mark Brantley, visited the Paradise Beach Nevis Ltd., formally known as Villa Paradisio on March 11, 2014, and toured the construction site with the General Manager Laughton Grant to get a first-hand view of the renovation and construction project. “We call it Paradise Beach Nevis, it’s a Boutique Resort; you can say villa complex. We will be adding resort type amenities for the guests that are coming. Here on the property right now, we have seven units. Five of them are four bedroom units at 3400 sq. ft; about 6900 sq. ft of deck and yard space and then we have two three bedroom units. These three bedroom units are 2900 sq. ft and they have a little over 4500 sq. ft of deck and garden space around them. They are entirely enclosed so there is maximum privacy to any guest who is staying within the resort. “They [the units] are fully equip with kitchens and that is one thing that we will add, since we don’t have restaurants. We will be able to bring some of our local chefs, so they can give the services to the guests that are staying in the resort,” he said. Grant added that one of the last phases to renovations at Paradise Beach Nevis is the reception building, the check-in area for the reception, a retail office, a gift shop, a lounge area and a Beach Bar and explained that as a part of the project, local contractors have been employed to complete the project. “As part of the whole project we do have presently 24 contractors working on the property trying to finish it up in various areas. As far as employees for the resort, we have four employees on property on right now. We hope to, by the time we are open, to get a good occupancy projected and we should have 15-20 employees coming in on this property,” he said. According to Grant, the construction will be completed in late April after which they will plan a marketing strategy, finalize the décor and have a soft opening in late summer with an official opening later in the year. Notwithstanding, the General Manager stated that after the project’s completion local workers in tourism related fields would be employed at the establishment. “We would be doing a lot of business with the outside community. We would be bringing in massage therapists who do their treatments in-house. We would do a lot of work with the guys from the boating community for our guests. “There are other small entities that can come in and provide service for our guests here on property, as well as we will be able to send our guests out to some of these other local vendors they can experience stuff off the property as well,” he said.